A new study confirms what nearly every energy analyst (and even coal executives) have already said: President Donald Trump’s plan to bring back mining jobs won’t work. 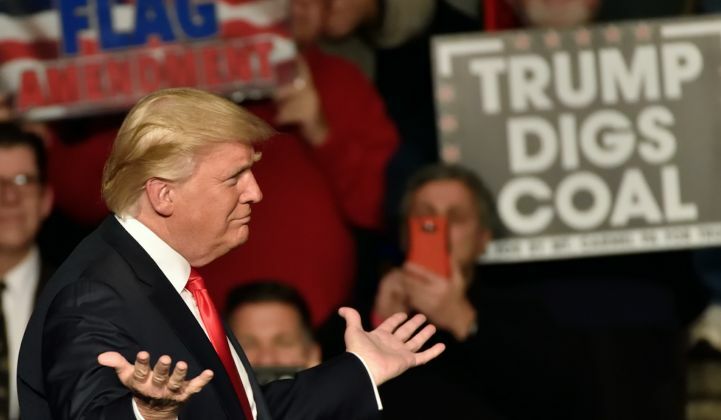 The report, written by a team at the Columbia School of International and Public Affairs Center on Global Energy Policy, concludes that rolling back environmental regulations, as Trump has done, would only have a minor impact on coal’s fortunes. Of the 10 major regulations targeted by the Trump team, only four have actually been implemented. And those regulations, which opponents say are the primary reason for coal's decline, played a small role compared to other forces. “Assuming their impact on U.S. coal production is additive, which is not necessarily the case, they are directly responsible for a roughly 3.5 percent decline in U.S. coal production relative to a world in which these regulations hadn’t been adopted. While meaningful, it’s a relatively small share of the 33 percent decline in U.S. production that occurred between 2011 and 2016," write the authors. The study clashes with figures from the American Coalition for Clean Coal Electricity that claim Environmental Protection Agency policies have been responsible for the retirement or conversion of 451 plants totaling 75.4 gigawatts. According to the Columbia analysts, the main reason for the coal sector’s financial problems between 2011 and 2015 was not tightening national regulations, but a drop in international demand. Falling exports, particularly to China, accounted for more than half of the drop in American coal company revenues, concludes the report. And this was only one of many problems facing the industry in the last half decade. At home, the top reason for coal’s woes was competition from cheap shale gas, which accounted for 49 percent of the drop in domestic consumption. Falling energy demand contributed to a further 26 percent of the loss. The impact of renewables was a third source of blame, accounting for 18 percent of the decline in the market. If correct, the findings mean Trump’s high-profile push to dismantle environmental regulations is unlikely to yield the jobs boost that many in the coal industry are hoping for. On the contrary, said Trevor Houser, partner at the Rhodium Group and one of the authors of the study. “The single most effective step President Trump could take to boost the U.S. coal industry is to restrict natural gas production,” he said. Houser served as Hillary Clinton's energy adviser during the 2016 presidential campaign. Even some prominent industry figures agree that chances of a strong return for coal are low. Robert Murray, the head of America’s biggest coal mining firm, welcomed Trump’s executive order -- but called for the president to temper expectations around jobs. The coal industry is currently pushing for a combination of deregulation and federal support similar to renewables. In a report published in 2015, the National Coal Council (NCC) argued for renewable-energy-style incentives for the development of carbon capture, use and storage (CCUS) technologies, so coal could ultimately qualify as a clean source of generation. While these technologies are under development, the NCC is also seeking support to retrofit America’s existing coal-fired fleet with high-efficiency, low-emissions (HELE) technologies, said CEO Janet Gellici. "Without financial measures and leveling-the-playing-field regulations, utilities are unlikely to pursue deployment of advanced coal plants with HELE and CCUS technologies,” she conceded. Even with government support, though, it remains unclear how the coal industry could adopt new technologies without increasing generation costs, which in turn would put it at an even greater disadvantage to natural gas.